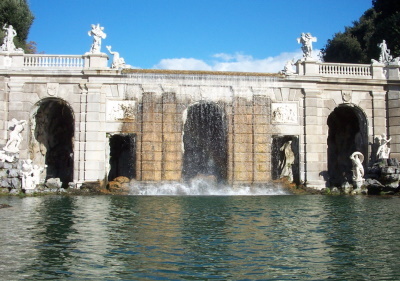 The 18th-Century Royal Palace at Caserta, with the Park, the Aqueduct of Vanvitelli, and the San Leucio Complex is recognized because of the way in which it was adapted to the surrounding landscape and integrated already existing elements. 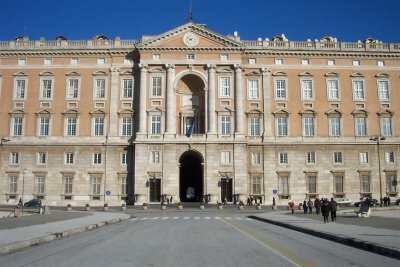 King Charles of Bourbon wanted a Royal Palace inland from Naples, the latter being too vulnerable for attacks from sea. The choice fell upon the ancient fiefdom of Caserta. Luigi Vanvitelli was chosen as architect. The first stone was laid in 1752. He wasn't able to finish his work - he died in 1773. His son Carlo followed in his footsteps, and finished the impressive 250 m. wide facade and the five floors of the building. Inside, there are some 1200 rooms and 1790 windows. 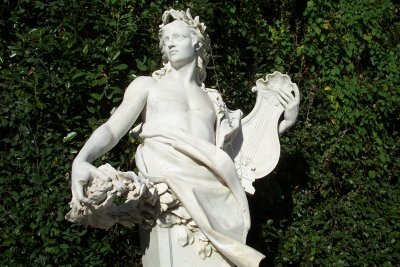 The work on the gardens was started in 1753: they were designed after the models of Schönbrunn and Aranjuez. They measure 120 ha. 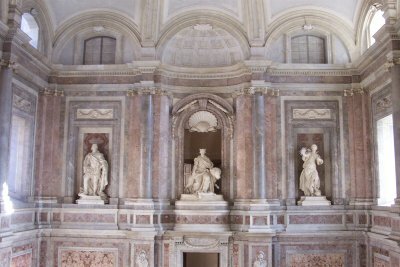 A rather profane remark first: the Reggia of Caserta has a large underground parking, from where a footpath leads you exactly to the front of the building. A great service in this often so difficult country for an average car driver. Caserta lies just north of Naples, on the way to Rome. Because of the sunny (though also stormy) weather I decided to start my visit with the gardens. Water is the central theme here. There's a large "canal" in the center, and innumerable waterfalls and fountains. Another thing absolutely not to be missed here is the giant staircase that leads up to the apartments. It's all marble where you look, with imposing statues looking down at you. Don't forget to look upwards, where colourful paintings decorate the ceiling. I visited this WHS in October 2018 and made good use of the underground parking. Its location is quite in the middle of nowhere and perhaps together with its enormous size, this helps to keep the number of visitors down. Then again, apart from its size, it definitely isn't one of Italy's best WHS and certainly not one of the best palaces on the WH list. Unlike other palaces, you have to pay an entrance ticket to view both the gardens and the interior. You cannot view the gardens for free (unless you specifically visit the great restaurant near the fountains and are happy with just a panoramic view of the gardens and palace - more on this later). The interior itself was enjoyable as we had the palace completely for ourselves but I wouldn't recommend paying just to view it. The highlight of the interior is the magnificent Teatro di Corte, one of Italy's best theatre interiors by far, which is only open on Fridays, Saturdays and Sundays, 10:00 to 13:00, thanks to the volontary work of Touring Club Italiano. 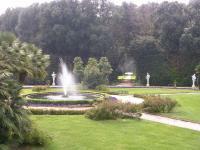 The palace and gardens are so huge that most of the time there isn't enough staff to look after it! The gardens are quite simple but make for a lovely walk in Autumn (there's also a shuttle service to the fountains or a horse cab). 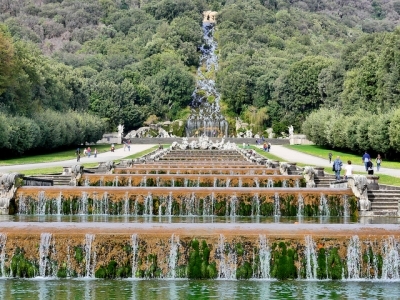 The highlight of the gardens are the lovely fountains with marble statues and the artificial cascades which reminded me a lot of the Bergpark Wilhelmshöhe in Kassel, Germany. Moreover, there's also a pleasant English garden near the biggest fountain and opposite is a convenient cafe and restaurant called Diana e Atteone which serves excellent pizzas and salads. They also have a panoramic view of the gardens and the palace in the terrace (and many locals by-pass the entrance ticket after having a meal here). It's not as big as I expected! That's probably your first thought when you see it on the walk over from the train station. It's further away than you think, and it's bigger than you first realise. It's difficult not to focus on the scale of this palace because it honestly is colossal - the largest palace in the world by volume, and it definitely feels like it. The internal tour of various rooms is interesting enough, particularly the four themed "season" rooms, and of course the throne rooms too, but if you've seen the inside of other baroque European palaces this one isn't especially striking. The gardens are great, and we did manage the 3km walk along the entire canal up to the fountains, but our garden exploration was cut short by a massive thunderstorm that blew in. If you watch my video below, you'll see the shuttle bus departing in the background, leaving us to walk the full three kilometres back to the palace in heavy rain. Mrs World Heritage Journey was not impressed! Spending two days in Naples wouldn't be complete without a daytrip out to the Royal Palace of Caserta. Such was the reasoning that my girlfriend and I adopted during our recent trip to Campania. We took the bus from the Piazza Garibaldi (main train station) in Naples, and, although traffic was especially bad, the round trip was relatively painless and quite cheap. The palace is easy to find in Caserta, due to its being the only sight in town; if you find yourself disoriented, simply follow the tour busses or the large groups of students to the ticket office. Once inside, we decided to use the audio guides, which were very informative for the interior of the palace but, due to regulations, unavailable for the gardens. And regardless of how grand or impressive the decorations are on the interior of Caserta, it is the gardens that brings the crowds. They stretch for several kilometres, with the intricacy of their design increasing with each passing step. While Caserta is essentially just another of the European monarchs' flights of fancy, its excellence commands attention and attracts visits from all those interested in the lifestyles and tastes of the royal familiies of the 18th and 19th centuries. Unfinished constructions: San Leucio Royal Colony: The king had planned to expand it into a true new city, called Ferdinandopoli, but the project was halted by the French invasion. Star Wars: 1997 Queen Amidala royal palace. 2002 episode 2: Attack of clones- Queen Jamillas palace. 141 Community Members have visited.